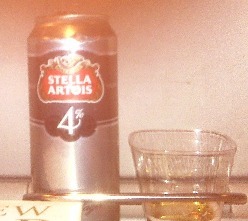 Coming home on the Eurostar, I walked up to the bar car to see what might be on offer. Of course, I didn't expect much. And I wasn't disappointed. Stella Artois 4%. From a can. In a plastic cup. Now, I have no idea why putting the alcohol level in the very name of the beer is considered a great marketing technique. Normal Stella is 5%, so not really much difference anyway. Does the big "4%" on the thing really hold any significance to anyone? Truth is, I don't understand this beer. I don't want to understand this beer. It's not huge in flavour. Don't bother.